The new Access charger from Ecotec provides you with a powerful, energy efficient battery charger in a sleek lightweight package. This is all accomplished utilizing a modern state of the art MOSFET power conversion circuit that efficiently and accurately converts AC power to the proper DC power levels required to precisely charge an industrial battery. Within the power limits of the charger, every Ecotec Access charger can be set to perform both conventional charging and various levels of opportunity and fast charging. There are 6 different charge curves preprogrammed into every Access charger. The feature rich electronic control of the Access charger is easily programmed to perform a variety of functions the way you want them performed. This auto start/stop control constantly monitors the condition of the battery and automatically compensates for variations in battery temperature, age of the battery, and the battery’s condition. Two different levels of security are provided with each level having its own password. Batteries can be equipped with BMU modules to allow multiple battery sizes, voltages and types to be charged by the same charger without reprogramming between charge cycles. The BMU wirelessly communicates battery size, type, voltage, and temperature information to the Access charger to enable optimum charging over a wide range of conditions and battery types. Optimizing the charging process is particularly important when opportunity and fast charging. 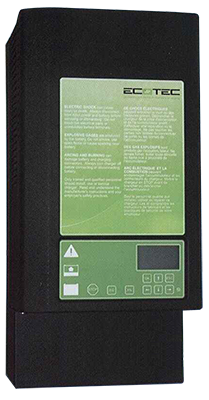 Data can be downloaded wirelessly into the Service Tool battery and charger data analysis software using the Wireless Gateway usb interface. Battery and charger usage can be easily analyzed in detail using Service Tool software charting and report generation features. The display is a backlit LCD display with adjustable brightness and contrast for ease of viewing in a variety of lighting conditions. The display can have up to 6 lines of information and also displays information graphically. Batteries must be equalized on a regular basis to ensure maximum life. The Access charger facilitate this routine through its auto equalize feature which allows equalize cycles to be programmed for a specific day of week, or by number of complete charge cycles. In addition to the energy efficient MOSFET design of the Access charger, the advanced control provides other energy saving options such as charge block-out periods. Each day, up to 3 different periods may be blocked from charging. This could be used to avoid peak demand periods, time of day use billing, or any other reason why you may not want chargers running during a particular time of day. When a battery has been sitting over the weekend there is a certain amount of self-discharge that occurs. In order to provide a fresh, fully charged battery, you can program the charger to charge for up to 60 minutes prior to the start of the workweek. Every Access charger is equipped with a radio transceiver that allows the charger to communicate with other chargers as well as a host computer when equipped with the optional Access USB Gateway. The wireless communication system is FCC certified. The ability to communicate between chargers allows the chargers to display the next available battery in a particular group, based on the length of time since the battery was completely charged. You can set up as many as 999 different groups. This ensures that all batteries receive equal usage and helps to promote a first in – first out battery rotation. This capability is standard in all chargers and can be implemented without additional hardware. In addition to the charger display, the next battery available can also be viewed on a remote terminal display. The wireless feature of the Access charger allows you to limit the AC power that a particular group of chargers are allowed to draw. This feature may be used where AC power is limited, or in applications where you don’t want the power consumed by the chargers to push your total power demand costs higher than necessary. With the addition of an optional pc board, the Access charger will communicate with many popular AGV charging systems. This ability to communicate with the AGV allows them to pull into a charging station and receive an optimum charge automatically. When the Ionic mixing charge curve is selected, the charger pulses the output current during the finish portion of the charge cycle resulting in brief periods of increased gassing. This gassing action improves the mixing of the electrolyte without increasing electrolyte usage. This ensures that the heavy acid at the bottom of the cell is thoroughly mixed throughout the cell, preventing stratification and extending battery life. All the opportunity charge curves include a gassing block-out period that prevents the charger from entering the gas producing finish charge stage for the first two hours that the battery is connected to the charger. In opportunity charging it is critical to return as many ampere-hours as possible in the limited time available. For this reason, the Ecotec Access charger does not shut down when it reaches the gassing point, but simply reduces the charge current to minimize gassing.